Enjoy Jalapeno Poppers? 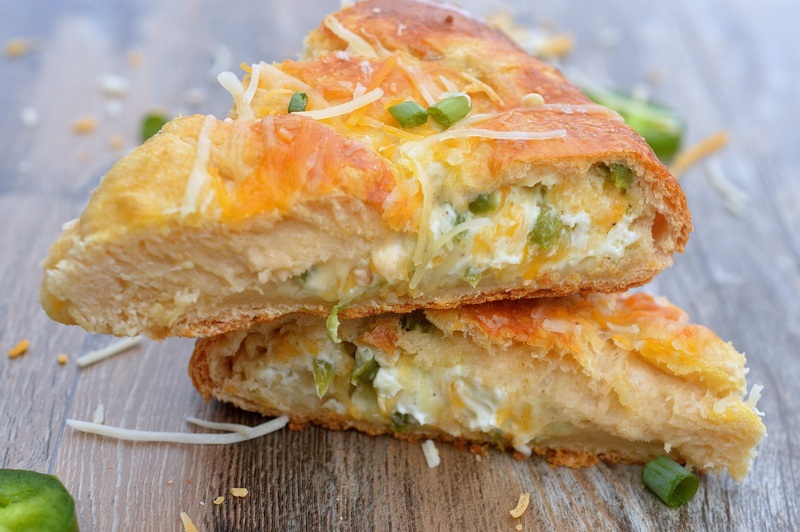 Then you will like this Jalapeno Popper Crescent Roll Ring. Whether you are hosting a gathering or staying in for a movie night, this easy to make Jalapeno Popper Crescent Roll Ring is a fun and flavorful appetizer to whip up. All you need are a handful of ingredients! Entertaining doesn’t have to be stressful…ok, maybe the cleaning part is (lol), however the cooking part doesn’t have to be. 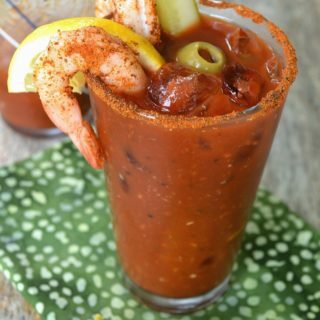 A couple of appetizers, and some cocktails, beer or wine and you have the bones of a great night with friends or family. 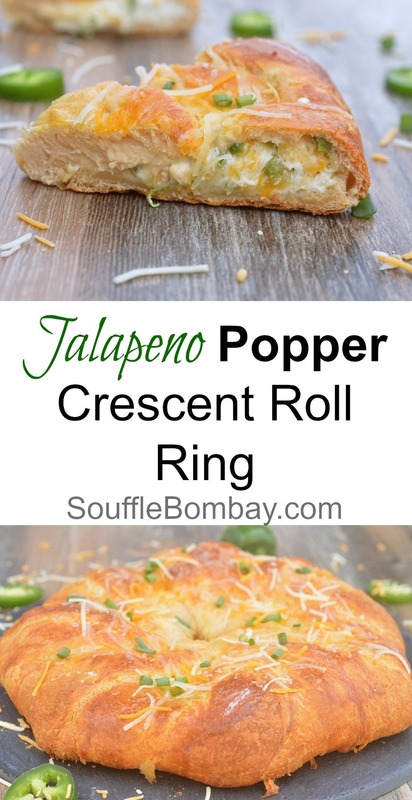 This Jalapeno Popper Crescent Ring is easy to make and not difficult to assemble at all. Don’t let the look of the”ring” fool you. 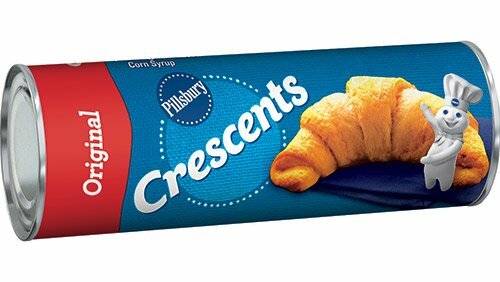 Pillsbury™ Crescent Rolls are a great foundation for so many recipes. Vegetable Pizza, and Sopapilla Cheesecake (OMG-Yum!) are two of my family’s favorites using crescent rolls. I teamed up with Pillsbury™ and Walmart to bring you this sponsored post. Hot and flaky Pillsbury Crescent Rolls are one of my husbands and children’s favorite things! I grew up having Pillsbury Crescent Rolls on holidays and as a part of Sunday dinner. 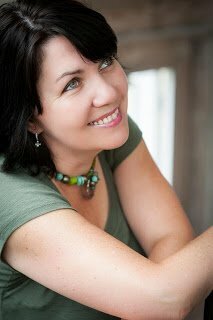 In my house…no crescent roll is left behind! 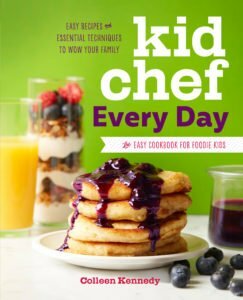 Check out this collection of easy recipes that will enhance any gathering. Pillsbury™ Crescent Rolls lend a hand to any cook. The dough is ready to go when you are for appetizers, desserts and dinners. Who doesn’t love the “pop” of a Pillsbury™ can? It was (and is) always fun to pop one open and to know that in just a bit you will be enjoying something delicious! Plus with Pillsbury, you know it will turn out perfect, every time! No mixing or kneading required!! 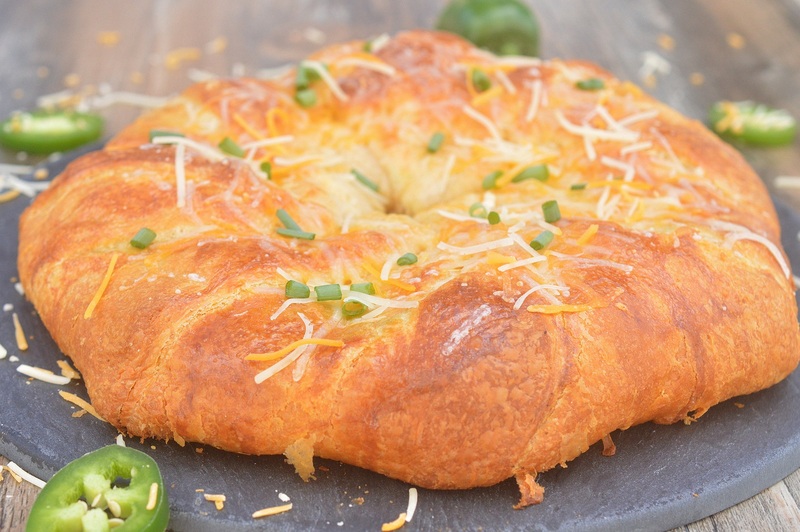 This Jalapeno Popper Crescent Roll Ring is decadent. 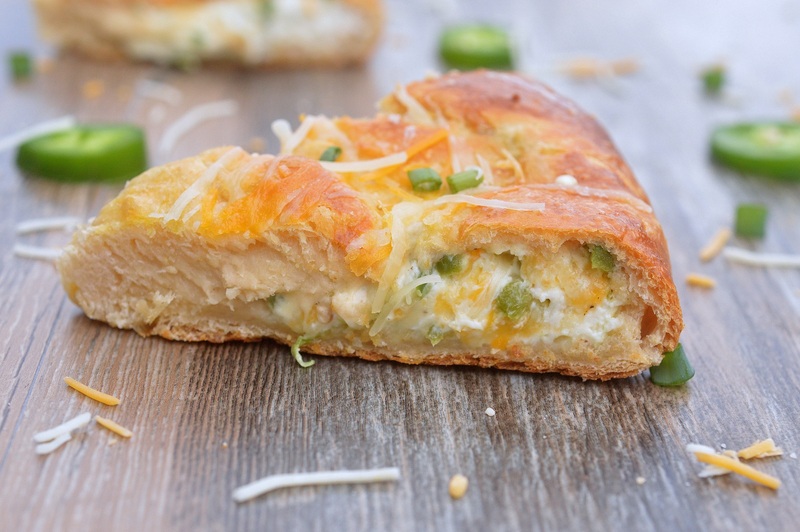 Layers of warm, flaky, buttery crescent roll envelopes smooth and creamy cheese speckled with jalapenos. Mmmm! If you like things spicy, leave the seeds in. If not, take them out. If you really love jalapenos…double the number. Once out of the oven, allow the ring to cool for 5 minutes or so and then slice and enjoy! Thanks again to Pillsbury and Walmart for sponsoring this fun & delicious Jalapeno Popper Crescent Roll Ring recipe! Click here for easy to make recipes that bring everyone together. In a mixing bowl, combine the cream cheese, shredded cheese, jalapenos, scallions and salt & pepper. Mix until fully blended. Open one crescent roll can, carefully separate the roll from the tube into 2 halves. Unroll one half, you will then break that into two rectangular pieces and place them on the baking sheet, you want to create a plus sign on the sheet, leaving the center with an open hole. Open the second can and repeat the process, filling in the open areas yet still leaving an open center. Gently pat down where the dough is perforated to seal and pat down dough pieces to one another just a bit. Scrape the filling onto the crescent roll dough in a circle (as pictured). Fold the edges up around the filling into the middle forming a ring, leaving a hole in the center. Bake in a preheated 375 degree oven for 20-25 minutes or until crust is golden brown. Remove, allow it to cool for 5-10 minutes and then cut into slices and enjoy! 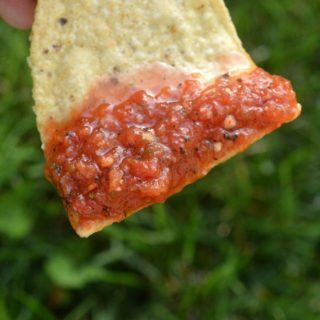 If you like things spicy leave either all of the seeds and stems or some of the seeds and stems in the mixture. If you want it milder, remove seeds and stems by first halving each jalapeno and then using a small spoon to scrape out the seeds and stems before chopping. Jalapeno’s vary in heat, you may want to taste yours to gauge how hot or mild they are. You can also use a food processor, first pulse the jalapenos, then drop in the remaining ingredients and pulse just until incorporated. If you want to add some meat to your Jalapeno Popper Crescent Roll Ring, add in either 1 cup of cooked and crumbled bacon or 1 cup of cooked loose sausage (blotted) to your filling mixture. I LOVE jalapeno poppers and this idea is genius!! Perfect party food. And a fun use for crescent rolls too! 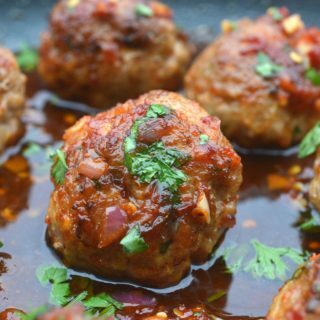 I love easy recipes I can use when entertaining! I am always looking for new ideas. I love jalapeno poppers! This sounds so good! I need to remember how many things you could make with their crescent rolls! This is so much fun to bring to a party or to enjoy with some friends when they come over with some drinks!! I really can’t get over this! Wishing I have enjoying a piece now! Rings like this are my favorite! 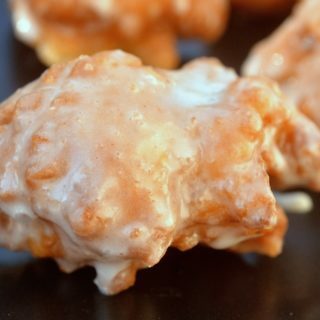 They’re so easy to make and I love the different filling ideas! My dad will love this! !